The impetus of the STAR WARS project was the desire to restore of the classic film for its 20th Anniversary. Lucas and Fox jumped at the chance to re-release all three films in grand fashion, adding and enhancing certain visual effects shots. Certain effects shots from the film have been completely replaced using digital technology, while others use original photography as plates for brand new background and foreground elements. With a few exceptions, the new and enhanced shots fit seamlessly into the classic sci-fi flick. The first of the brand new shots is a gorgeous establishing shot of R2D2 on Tatooine, just before the Jawas capture him. The shot begins on a stunning Tatooine sky at dusk, and tilts down to the lonely droid navigating the Tatooine surface. In addition to the new R2 establishing shot, two more new 'replacement' establishing shots were made for Obi-Wan's home and Luke's moisture farm. The 1977 Obi-Wan establishing shot was an odd, nondescript, low angle of Luke's speeder parked outside a hut. This new shot is very wide and beautiful, featuring a lot of great colors and textures of the Tatooine surface. A slight zoom was added to the shot--if the artists had created a dolly-in instead of a zoom, the shot wouldn't have fit into the film. If you look carefully at the original film, there are very few dynamic camera movements, like cranes and dollys. The other establishing shot is an extended wide shot of Luke's farm. Using the original 1977 shot, the artists shrunk the footage, and added more sky, more of the Jawa's cruiser and more of Luke's farm in this breathtaking shot. An isolated shot of the new CG Dewback and CG Stormtrooper. The background plate is a new shot, photographed in Yuma, AZ. Notice the slight highlight added to the trooper's helmet, consistent with the filters used back in 1977 for Tatooine scenes. A CG Stormtrooper dismounts from a CG Dewback in this enhanced shot. The animation of the Trooper getting off the beast is phenomenal. 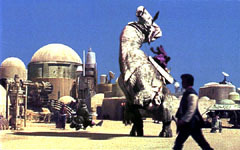 The first shot of the search sequence features real Stormtroopers and the synthetic Dewback and trooper in the background, along with an Imperial craft zooming across the sky. Searching for the C3PO and R2D2, Imperial Stormtroopers use Dewbacks to help in the search. Originally, the scene consisted of a single shot of a Stormtrooper on an unmoving Dewback far in the distance--then the camera pans left to two troopers in the foreground. The sequence is now three shots long, with two brand new shots using newly shot Stormtrooper footage in Yuma, Arizona (the original photography took place in Tunisia). The two brand new shots feature fully computer generated Dewbacks with CG Stormtroopers riding them. The CG models look great, and the compositing of these two shots have the same 'look' as the original 1977 photography. The last shot is the 1977 pan, but instead of the immobile Dewback in the distance, we now see fully mobile CG Dewbacks and Stormtroopers. The CG elements and plate photography are perfectly married together. A great new tigher shot of the Jawa's land cruiser is included in the Special Edition, replacing a very long, wide shot of the same cruiser. Many of Luke's landspeeder shots (around 6 in all) have been 'fixed'--the orange optical blur underneath the floating speeder from the 1977 version has been erased and a new shadow was created. The enhanced landspeeder shots (4 in all) add the illusion of the floating craft. This enhanced shot features a man walking a Ronto (frame left) and the elimination of the orange distortion pattern underneath the floating landspeeder. in this all-new shot from the Mos Eisley sequence. Luke, Obi-Wan Kenobi and the two droids then venture off to Mos Eisley, Tatooine's bustling spaceport. The new Mos Eisley sequences feature both completely brand new shots as well as many brilliant enhanced shots. The first is a brand new wide shot of the spaceport--the view that Obi-Wan and the gang sees as Kenobi calls it "a wretched hive of scum and villany." Spacecraft can be seen zooming in and out of the port, and the buildings look a lot more dense in this great establishing shot. The landspeeder zooms over the camera into the city in another replacement shot. Instead of a blank sandy surface, many tiny creatures are seen hanging around the city--the Mos Eisley equivalent of pigeons. The design is very cute and the animation is really nice as the landspeeder zooms overhead, although it was quite apparent that the effect was accomplished in post-production. The contrast levels seemed a bit too high--the animals didn't seem as if they were actually in front of the camera. The hero shot of the sequence appears next, as a completely new shot begins on two fighting droids, follows the landspeeder with a pan right, and cranes up, dozens of feet above the ground, allowing the audience to see the large, bustling city for the first time. The animation of the two droids (one a human-like droid and the other a floating probe droid) is fanatstic and quite funny. Numerous CG elements made up the shots, along with many digital matte paintings and miniatures. Although the shot technically and aesthetically brilliant, it simply does not fit into STAR WARS. The establishing crane shot is a standard in many films, but the 1977 version of STAR WARS had very little camera movement. Another five shots follow (some brand new, some enhanced), and many include new, thirty foot tall creatures, called Rontos. The animation and models of these CG models look fantastic, and compositing of these shots integrated them into the plate photography. If the Ronto's shape looks familiar, it should--it's actually a altered version of the CG model created for JURASSIC PARK's Brontosaurus, hence the name Ronto. In a few other shots outside the cantina, CG Rontos and Dewbacks, along with the floating Imperial droids are featured in the backgrounds of original 1977 photography. The match-moving and rotoscoping of these shots are fantastic--the shadows created for the floating droid are right on the money and are completely integrated into the 1977 shot. The CG Stormtrooper makes another appearance in an enhanced shot--the Stormtrooper dismounts from the Dewback in some of the best humanoid CG animation I've ever seen. Jabba the Hutt makes a cameo in STAR WARS in this newly restored sequence. One of the biggest new scenes is the restored conversation between Han Solo and Jabba the Hutt. Originally shot with a human actor as Jabba, CG Supervisor Joe Letteri and animator Steve "Spaz" Williams replaced him with a fully CG Jabba slug, as he appeared in RETURN OF THE JEDI. This Jabba can slithers and squirms his way to Han, and has a discussion with Solo in the 5 shot sequence. Small alterations to Harrison Ford's movements were made to accomplish a seamless (and sometimes very funny) encounter between the human and the CG creature. A new feature to the sequence is Boba Fett--an actor in costume performed in front of a bluescreen in order to integrate the bounty hunter into the sequence. One problem I have with the new Jabba sequence is Jabba's eyes. The bright orange eyes of the puppet Jabba in JEDI are realized in the new shots as glossy, desaturated bulbs. Also, Jabba is far too expressive in this chapter of the STAR WARS saga, which betrays the way Jabba appears in RETURN OF THE JEDI. An exclusive side-by-side comparison of the 1977 production footage and the newly enhanced shot including a computer generated Jabba. Careful erasure of the original actor as well as extensive rotoscoping and animation of Solo add to the realism of the sequence. As the Falcon takes off from Mos Eisley, one brand new shot shows a CG Falcon rising from Bay 94, and an enhanced wide shot of the Falcon zooming into the air features a new, dynamic aerial move. As the Falcon tries to escape the Death Star's tractor beam, new, accurate camera shake animation was added to the interior shots. A new explosion was shot for Alderaan's destruction, and features a colorful shockwave, very similar to ILM's shockwave created for STAR TREK VI. The Death Star's explosion was enhanced with this shockwave, as well. A terrific enhanced shot was created for Han Solo's furious attack on a group of Stormtroopers. In the original shot, eight Stormtroopers turn around and fire on Solo. In the hilarious enhanced shot, an entire legion of Stormtroopers appear in the background. In this incredible composite, the Rebel base exterior has been enhanced, giving the huge structure a new, rougher exterior. No new model photography was used for space sequences for the Special Edition of STAR WARS--all spacecraft were created as CG models. Textures were scanned directly off of the original miniature models created in the late '70's, however. CG representations of the Millennium Falcon, the X- and Y-Wing fighters, as well as TIE Fighters will appear onscreen. Intending to keep the pacing of the original film intact, the effects artists crafted each new space shot (around 30) to be the same frame length as the original shot. The choreography of the shots in question was enhanced--the new CG craft afford the animators a greater range of movement than the motion-control shot models. Instead of a limited three dimensional space for which the camera and the model to interact (due to stage size, model and camera rigging, etc. ), the virtual camera and virtual model have infinite possibilities in terms of distance and perspective. New, exciting dynamics have been created to enhance the sequences' drama, not alter them. ...and doesn't end until the camera pans left to see the ships pass the camera. Many shots of the final battle sequence were re-made with more dynamic aerial manuevers. The enhanced shots make the final sequence much more dynamic and smooth out the rough edges of the battle. All in all, the new and enhanced shots fit very well into the sci-fi classic. Lucas and ILM have expanded the STAR WARS universe and allowed the audience to witness the director's original vision.